"The Struggle for World Dominion"
"Malachi Martin served three popes as diplomat and spy, speaks seventeen languages, is a renowned Biblical scholar and a professor at Rome's Pontifical Biblical Institute. He helped translate the Dead Sea Scrolls.—Decline and Fall of the Roman Church. Know any other churches engaged in espionage? Would it not be better for Roman Catholic politicians if the Vatican never engaged in espionage? 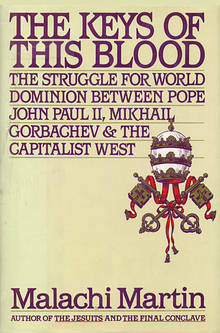 The lengthy book we want to draw attention to by Martin is entitled The Keys of This Blood: The Struggle for World Dominion Between Pope John Paul, Mikhail Gorbachev & the Captialist West (bold added). Incredible, isn't it? The title on the cover boldly proclaims that John Paul wants to take over the world, and the massive contents purportedly lays out his plans for accomplishing this. The cover of Martin's book calls John Paul's endeavors "the struggle for world dominion." Ellen White called the papacy's endeavors "a fierce and determined conflict to regain control of the world." Kind of similar, isn't it? In [the] eyes [of groups like "Adventists, Baptists and Evangelical sects"], their regard and respect for democratic principles impose upon them the obligation—the religious, as well as the civil and political obligation—to defend every person's right to be wrong. Every person must have the right not only to believe in Hell of the Damned and Heaven of the Saved. Every person must literally be assured the right to choose Hell over Heaven. That obligation carried to that extreme not only sets the Minimalists apart from John Paul; it sets them against him, as well. It sets them apart from the Holy Father, because democratic principles can never take precedence over divine revelation. No one can be forced to believe in Heaven or Hell, or to choose the one over the other. Nevertheless, it is axiomatic for John Paul that no one has the right—democratic or otherwise—to a moral wrong; . . . .—p. 287. Martin thus calls freedom of conscience an extreme, and says that groups that advocate such a freedom are "against" John Paul. In other words, Martin claims that, similar to the popes of yesteryear, today's papacy still does not believe in freedom of conscience, and would not allow such a freedom to be a part of the new world order it seeks to create. Who defines a "moral wrong"? Rome answers, "The papacy." Now if no man has a right to commit a moral wrong, and if the papacy is the one that defines what is and isn't a moral wrong, then is there anything at all that might prevent a return of persecution if the papacy regains its lost supremacy?